RP107 CMI Medium Stainless Steel Rigging Pulley 5/8" Capacity. 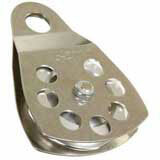 Features and specifications: Stainless Steel Cheek Plates and Aluminum Sheave. Moveable cheek plates for easy insertion anywhere in a line.